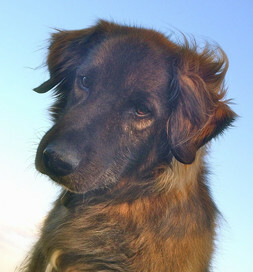 Julianna Murphy adopted Dakota, a Belgian Shepherd/Golden Retriever mix, from Guelph Humane Society in Ontario. The dog had been picked up as a stray. He was thin, and his coat was matted. But sometimes someone just knows this is the one. Dakota expresses himself with a tilt of his head. “Dakota won my heart,” Julianna says, “and I could feel sparkles dancing inside, making music to my heartbeat. I envisioned him home with me,” and soon it was a reality. Such a friend is a gift, and because he was Julianna’s first dog, each experience was fresh and new. She bought him a fine leash and collar for their walks. “The leash did not last long as his teeth connected around it and cut it like a sharp knife,” she says. “He did this to many subsequent leashes. His favorite place to do the deed was while I stood talking to someone or while waiting at a crosswalk for the light to change.” She didn’t detect the difference at first because he continued to walk obediently beside her. “He was free to leave but never did. After a number of leashes, he must have understood I was his forever person and agreed to a red horse-lead for our walks.” No more leash chewing. Julianna knows that it won’t be too many years before she has to find another companion. She’s hoping he or she will bring sparkle to her heart the way Dakota has. “I keep coming back to Petfinder.” One day, the magic will strike again.